In Liberia, there is every opportunity to run a successful business voice over ip to terminate calls, although the antifraud is hard enough. In this direction, the price per minute of an international voip call is $0.28. This cellular communication in the country is considered to be the cheapest among African states. You can make good money if you manage to bypass the AntiFraud system. Despite the fact that Liberia is quite a small country (about 4.3 million of the population) considerable amounts of international traffic are concentrated in the country. Transit companies offer terminators live traffic starting from 25 thousand minutes per month. The penetration level of cellular communication in the country is about 66%, which is much lower than in neighboring African countries. However, experts believe that the mobile sector is quite promising in Liberia and will be actively developed in the near future. It is illegal to own VoIP termination equipment - SIM-banks - in Liberia. Local governing bodies in the sphere of telecommunications use special devices and technologies to track this type of activity, although these systems are not perfect. It is important to ensure protection for SIM-cards from the lock and secure the equipment, effectively simulating the behavior of the person in GSM networks and choose the right location to place GSM gateways and SIM-banks. Another important aspect is the purchase of SIM-cards for termination. In Liberia, mobile starter packs can be purchased for $5-10. Based on the average duration of the SIM-card for about 3 days, you will have to spend about $80 a month to purchase SIM-cards for one channel. In this case you have to choose a profitable prepaid tariff plan that will allow you to minimize costs on local calls and increase the profit. Cellcom is one of the most popular among the terminators. It ranks second for the coverage in the Liberia market, after MTN (45% of the total population). The subscriber base of the operator is more than 1.13 million users. Not so long ago Orange, an international corporation, acquired the company stating that Cellcom is the leader on the Liberian market of cellular communication. Indeed, Cellcom Orange and Lonestar MTN are two operators, with a small gap in the coverage of the market (1.13 million versus 1.33 million connections). They compete with each other, and are far ahead of the small mobile operators of Liberia. 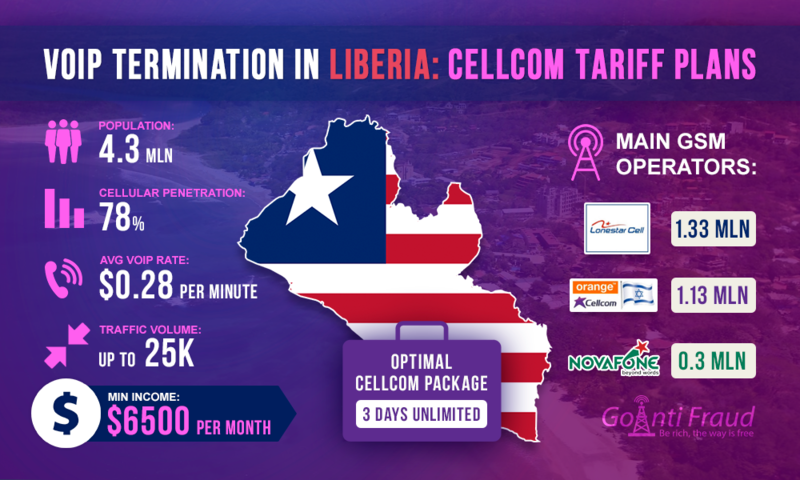 It is convenient for a business voice over ip Liberia that Cellcom offers 2 types of accounts for prepaid subscribers - not only in the national currency (Liberian Dollar), but also in US dollars. Standard local call tariffs for Cellcom subscribers are $0.15 within the network and $ 0.19 - to other operators. But it is not the cost per minute but per 30 seconds of conversation. Accordingly, one minute costs $0.30-$0.38, which is quite expensive. But it is possible to connect the SUPER LD Flat Rate bonuses, which allows making calls within the network and to numbers of other operators at $0.1 per minute. In addition, when topping up through the E-Transfer online system, you get 700% credit to the bonus account. Bonuses are valid until midnight of the same day. FREE Night Calls. From midnight to 5 a.m. tariffs for local calls are zero. That is, you can make calls absolutely free at night, subject to availability of $5 on the account. 3 days Unlimited +. For $1, you can activate the service of the unlimited cellular network inside Cellcom. The tariff plan is valid for 3 days and then you need to top it up again. Limitless Voice Plan. For $5, you can connect this service for 5 days and get the possibility to make free calls to Cellcom. For $10, you get the unlimited service for 30 days. In terms of benefits, it seems that the Limitless Voice Plan package is the best choice. Indeed, calls will cost less, but termination is not the best option. With an average lifespan of a SIM card for about 3 days, you can simply have no time to use all of the money invested. It makes more sense to give preference to the 3 days Unlimited tariff plan, and get the opportunity to call Cellcom numbers for 3 days for $1. Work 5 hours a day, for 3 days, the cost of a minute of conversation in the country will cost you $0.011. This is cheaper than the SUPER LD Flat Rate bonuses, which are valid for 1 day. In order to get a low cost price of a minute, you need to replenish your accounts with more than a dollar. Using 3 days Unlimited Plus, you can get an income of about $1,500 from a single channel if you have a dbl goip gateway working 5 hours daily, taking into account the 3-day average life of the card.